Early rain forced Texas manager Ron Washington to push back ace Yu Darvish one day in favor of long reliever Scott Baker in the series finale against the Baltimore Orioles. After a nearly one-hour wait at the start, the rain held off but the Orioles completed a four-game sweep of the Rangers with a 5-2 victory on Thursday night. Despite the loss, Washington still felt good about his decision to go with Baker over Darvish. "The understanding was that the window was going to be small, and fortunately we got the game in," Washington said. "I thought Bake did a heck of a job to keep us in the ball game. We just couldn't hold them out of the bullpen. "Bake was on alert (Wednesday) when we heard of the weather. He prepared today, along with Yu. If we decided to go with Yu, he would have been prepared. And if we decided to go with Baker, he would have been prepared. It wasn't all of a sudden that Bake became the guy. He knew coming into today that it was a possibility." 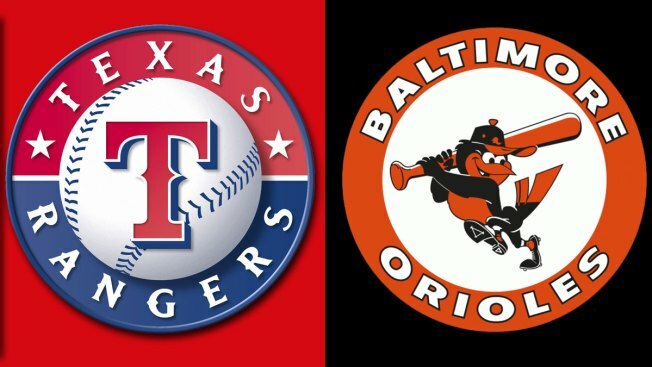 Steve Pearce had a career-high four hits and drove in two runs, and Wei-Yin Chen shut down Texas again in the Orioles' win. The Rangers have lost nine consecutive road games -- their longest skid since 2005 when current Orioles manager Buck Showalter was at the helm. Baltimore (46-39) completed its first four-game sweep against Texas since 2004 and improved to a season-high seven games over .500. Baker (0-2) allowed three runs and seven hits with two strikeouts and one intentional walk in 4 2-3 innings. Shin-Soo Choo hit his eighth homer of the season for Texas (37-48), which has lost 13 of 15. In two previous starts this season, Baker went 0-1 with 6.00 ERA -- allowing eight runs in 12 innings. In 177 games over nine years, Baker has made 164 starts. He said he is ready to fill any role needed by the club, either out of the bullpen or part of the rotation again. "I am fully embracing this role," Baker said. "I'm coming to appreciate how difficult this role can be. Think as a starter, you take for granted how nice it is to have a routine, to have bullpen sessions where you can actually work on different pitches. "I respect guys who are able to do this role and do it well. You've just got to be ready at all times." Darvish will start Friday night when Texas will take on the Mets in New York. Chen (8-3) allowed two runs and six hits with four strikeouts and two walks in six innings. He is 4-0 in four starts against Texas with a 1.67 ERA. Left-hander Zach Britton earned his 12th save and hasn't allowed a run in 21 consecutive relief appearances. Pearce had eight RBIs in the four-game series. Since the beginning of June, he is 31 for 81 (.383) with nine doubles and 17 RBIs. Nick Hundley had two of Baltimore's six doubles and scored twice. "We're relying on some people, and people are stepping up," Pearce said. "We're pitching, we're hitting. We're having timely hitting. We're finding ways to get it done." It was the first time in the Orioles' last 34 wins that they didn't hit a homer. "It's so hard to win a four-game series, or three out of four, in the major leagues," Showalter said. "The guys kept a real intensity level through the rain delay, not knowing whether we were going to play or not. So many dynamics of what's going on with the 1:30 game (Friday) and weather issues there, getting in and out tonight." Baltimore took a 1-0 lead in the third inning when Pearce hit a one-out RBI single to left. Texas responded the next inning when Carlos Pena's grounder to second scored Adrian Beltre, who led off with a single. Choo made it 2-1 with a solo shot off Chen in the fifth. Baltimore regained the lead at 3-2 in the bottom half of the inning. After Ryan Flaherty led off with a double, Hundley followed with another double, and scored on Pearce's double to center. "I probably ran out of gas at the end a little bit," Baker said. "It was pretty muggy out there. It was kind of hard to catch your breath. I would have liked to have made some better pitches, especially that fifth inning. "You just can't expect to give a couple of doubles and then them not to score. I would have liked to have had a better showing." The Orioles added a pair of insurance runs in the seventh on a sacrifice fly by Adam Jones and an RBI single by Chris Davis. NOTES:Baltimore OF Henry Urrutia (sports hernia surgery) will begin a rehab assignment next week. ... Baltimore RHP Bud Norris (strained right groin) took fielding drills, and is expected to throw a bullpen session or simulated game on Friday. Norris is eligible to come off the DL on Monday and could start that night against Washington. ... The Rangers used a new batting order for the 18th consecutive game. ... Pena went 0 for 3 and is mired in a 3 for 33 slump since being promoted from Triple-A Round Rock on June 24.